Do you know why God has placed you on this earth? Do you know why you are who you are? Do you know why you are here at this church and why God has given you the personality and abilities that make you who you are? Well, the ultimate reason is to glorify God. To bring glory to God. And one of the ways we do this is through service, through ministry. Through using the abilities and talents God has given you to exalt God, evangelize the world, and edify, encourage, and equip other believers. The reason you are on this earth is to be a minister. To be involved in a ministry. There is something that God wants you to do, and only you can do it. If you don’t do it, it won’t get done. And so one of our goals in life should be find out what God wants us to do, and then do it. This morning, as we continue to study verse by verse through the book of Luke, we learn some Principles of Ministry from the lives of John the Baptizer and Jesus Christ. From John, we learn what to focus on in ministry, and from Jesus, we learn what steps to take to prepare yourself for ministry. To see this, turn with me to Luke 3:15-20. This passages shows us what John focused on during his ministry, and therefore, what we should focus on in our ministry also. John focused on three things in ministry. The first is that he focused on pointing people to Jesus Christ. In our own ministries, we must also point people to Christ. Look at Luke 3:15. Luke 3:15 says the people were in expectation. This tells us right away that John was doing his job. He came to tell them that Christ was coming, and they are expecting Him to come, they are looking for His arrival. And some of them, we read in Luke 3:15 began to wonder whether John was the Christ or not. I’m sure this was a temptation for John. Oh, probably not to admit that he was the Christ, but maybe at least to think that he was someone pretty special. I mean, if they thought he was the Christ, they must think he was pretty good. There was a temptation here for John to fall into pride and arrogance. But it is important in ministry to always keep humble, to keep our pride in check. To never think more highly of ourselves than we should. And the best way to do this is to point people to Christ. To not only get your eyes off of yourself and your accomplishments and all that have done, and turn your eyes upon Jesus, but to get people to look past you and turn their eyes upon Jesus also. This is what John does in Luke 3:16. Luke 3:16. John answered, saying to all, “I indeed baptize you with water; but One mightier than I is coming, whose sandal strap I am not worthy to loose. And John says, “He must become greater; I must become less” (John 3:30). John always wanted to get himself out of the picture and get Christ into the center. John was content if he never even got recognition for what he did; he just wanted people to recognize Christ. John’s ministry was completely focused on pointing people to Christ. Telling them that Christ was coming. That is what our ministries should be focused on too. It is not about us. It’s about Him. It’s not about our glory and fame. It’s about His glory and His name. For You alone are God, and I surrender to Your ways. You know, when we try to do things our way, when we try to get our own recognition and our own fame, we really our setting ourselves up as God. We really are trying to replace Jesus Christ. John’s ministry was preaching, and he preached Christ. The apostle Paul did the same thing. Paul writes in 1 Corinthians 1:23 that he focused on preaching Christ. But beyond John and Paul focusing on Christ, did you know that even the Holy Spirit points people to Christ? Jesus says in John 16 that when the Holy Spirit comes, He will glorify Christ, and point people to Christ, and draw people to Christ. If you ever see a ministry that does not focus on Christ, you have ministry that has gone astray, because all ministry that is Biblical and all ministry that is Holy Spirit inspired will lift up the name of Jesus. In the last few weeks, I have talked about reforming your life through repentance. But this will never happen without Christ at the center of your life. This will never happen unless Christ is the Lord of your life. No ministry will ever be successful unless Christ is the focal point, the source, the reason, the enabler, the hub, the core, the center, the middle, the heart of all that you do. Like John, pray that through your ministry, Jesus would become greater, and you would become less. We must point people to Christ. But secondly, we must remember that judgment is coming. Look what John the Baptizer says. Picking back up in Luke 3:16. This is all about the coming judgment. John is telling his audience that judgment is coming. He says that although he baptizes people with water, Christ will baptize you with the Holy Spirit and fire. The baptism of the Holy Spirit is something that happens to believers beginning at Pentecost in Acts 2. John doesn’t focus on that much. Instead, in John 3:17, he focuses on the fire. We talked about this some last week. While fire sometimes is a symbol for hell, it is most often a symbol, a picture of temporal judgment while on this earth, or of the Bema, the judgment seat of Christ. 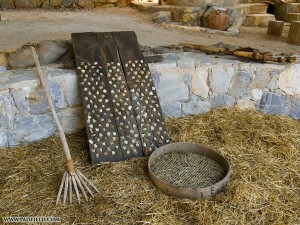 The picture John uses here is of a threshing floor. Grain was harvested, and then piled on a threshing floor outside where there might be a light cross breeze. They would take a type of shovel called a winnowing fan. It was a wooden, fork-like shovel. Like a cross between a shovel and a pitchfork. They would use this fan, this shovel, to toss the grain in the air. It would create a draft of air to blow the chaff off, and could be used like a shovel to toss the grain. The grain, because it is heavier, falls back down into the pile, but the chaff blows off to one side. When the grain and chaff were adequately separated, they would load the grain up into bags or bushels and cart them off to storage in a barn or something, and then, if the chaff had piled up in places, they would burn the chaff. Because it was so light, it would burn really quick. We have a lot of cottonwood trees around here, and every summer, right around the fourth of July, it looks like it’s snowing, because the little puffs of cotton fall off the trees and get blown around by the breeze. It collects on the drive way along the grass. I like to go out there when it gets dark at night, and light the piles of cottonwood seeds. It burns real fast, and burns all along the edges of the driveway like a line of gunpowder. But because it burns so fast, it doesn’t even singe the grass. This is kind of what John is talking about here with the chaff. Jesus is coming with the Holy Spirit, to separate the wheat from the chaff. The chaff gets blown away, and then burned up. And this is exactly what Jesus accomplished in his ministry. His parables and miracles and teachings were often directed toward separating the wheat from the chaff. The wheat fell back to the ground and continued to follow him and listen to his teachings, but the chaff would get offended or confused and would turn their backs on Jesus and go off somewhere else. John warns his hearers that this separation is coming, and we need to be warned that it is coming for us too. Do you see? Fire is coming. Judgment is coming. If you have built on the foundation of Jesus with gold, silver and precious stones, the fire will not touch what you have done. But if you have only wood, hay and stubble, it will be burned. Notice verse 15. It says that “If anyone’s work is burned, he will suffer loss; but He himself will be saved, yet so as through fire.” You see, this is not an issue of whether you go to heaven or hell. It’s an issue of how your works will fare in the fire. Many of John’s hearers had only chaff. Had only wood, hay and stubble. When Jesus Christ comes, they get blown away. They get burned up. And it burns it all up. John says it is unquenchable fire. Despite how some want to read hell into this text, it is not here. John is just saying that all the chaff gets burned up completely. None of it escapes the flames. When you stand before the Judgment seat of Christ, Christ will not burn up just some of your wood, hay and stubble. All of it’s going to burn. And if that’s all you have, well, you’ll make it into heaven, but so as through fire. This is what John is telling the Jews in his day, and what he is telling himself. He wants to have gold, silver and precious stones on that day, not wood, hay and stubble. He knows that Christ is coming, and has done everything he can to point people to Christ, and to live with Christ as his focus. He knows that judgment is coming, and so he lives accordingly. If you want to have an effective ministry, you must keep your eyes on the prize. Keep focused on heaven. Remember that we must all stand before the judgment seat of Christ. Only in this way will we have an effective ministry. But you must understand. An effective ministry will not get you fame or glory. Sometimes, the most effective ministries are with only a few people. An effective ministry is not always a popular ministry. People don’t want to hear this today. They don’t want to hear the Word of God, and they definitely don’t want to hear that Christ is coming again, that He is the only way of salvation, or that judgment is coming. Such things are not a popular message. But this is what John preached. And look what happened to him in Luke 3:18-20. Luke 3:18-20. And with many other exhortations he preached to the people. But Herod the tetrarch, being rebuked by him concerning Herodias, his brother Philip’s wife, and for all the evils which Herod had done, also added this, above all, that he shut John up in prison. If you ever have trouble keeping all of the Herods separate, that’s okay. There are six of them in the New Testament, and all of them are related in one way or another, not only as a ruling family, but also in crime and cruelty. This Herod is Herod Antipas, the second surviving son of Herod the Great. As we read in Luke 3:19, he was the tetrarch of Galilee. Although he was on okay ruler from Rome’s perspective, he was not a real nice man. He had all of the vices, but none of the good qualities of his father, Herod the Great. He was covetous, greedy, luxurious, corrupt, suspicious and cunning. All of this though is typical of most rulers of that day. What made him a bit different though was that he stole his brother’s wife. And John the Baptizer didn’t think much of this, and so, being the bold preacher that he was, proclaimed that Herod was sinning against God, against his former wife, against his new wife, and against his brother by doing such things. John preached that judgment was going to come, even upon Herod. Rulers and those in authority are not above the judgment of God. Even the powerful must give an account to God. And John reminds the people of this. And Herod heard about it. Well, this pricked Herod’s pride, and so he had John arrested, put in prison, and eventually beheaded. So follow the timeline of John’s ministry with me. He grows up in the wilderness, and then one day in about 27 or 28 A.D., he begins to preach to a few people in the wilderness along the Jordan River. Soon, there are thousands coming out every day to hear him preach. Lives are being changed. People are repenting of their sin. But somewhere along the line, he condemns Herod, the ruler of the land, for his immoral behavior. Herod hears of it, arrests John, puts him in prison. While in prison, most of John’s disciples leave him, and turn to follow somebody else. And finally, John is left all alone, wondering if his life is a waste, if he has proclaimed a false Messiah, and one night, as he is trying to get comfortable on the dirty ground of his prison cell, two soldiers come and chop his head off. We will study more about all of this when we get to Luke 7. But this is not the way any of us want to conclude a ministry for God, is it? But guess what? Even though, by worldly standards, John’s life and ministry ended in failure, he died at about 30 years old, alone, in prison, God’s viewpoint is different. Jesus says in Luke 7:28 that among those born of women up till that time, there was none greater than John. Those who are least in the eyes of the world are often greatest in the eyes of God. You see, John’s ministry focused on Christ. He pointed people to Christ, rather than to himself, because he remembered that this life is not all there is. When we focus on Christ in our ministries, God uses us in mighty ways for His Kingdom. The world may not see it. The world may not applaud. But God sees, and he is pleased. So this morning, if you say, “I want to be used by God. I want to have a ministry that is pleasing to God. I want to be like John, pointing people to Christ. Popularity and fame don’t matter to me, I just want to do what God wants me to do.” If that is how you feel, then follow closely as we finish up this morning by looking at Luke 3:21-22. Luke 3:15-20 show us from the life of John what to focus on in ministry. Luke 3:21-22 show us from the life of Christ how to prepare for ministry. When you become a Christian, God gives you a specific ministry He wants you to perform. But there are always, always, always, steps of preparation that must be taken in order to get there. God can use you just the way you are, but God never wants you to stay just the way you are. The more steps you take in preparing for ministry, the more God can use you, and the more effective your ministry will be. Even Christ had to go through certain steps to be ready for His three years of ministry. We see this in Luke 3:21-22 where we learn from Christ how to prepare for Ministry. This is what Jesus did. Jesus prepared himself for ministry by disassociating himself from corrupt Judaism. Look at Luke 3:21. This is the baptism of John which Jesus goes through here. The other Gospel accounts tell us much more about this event, but remember what we studied a few weeks back. 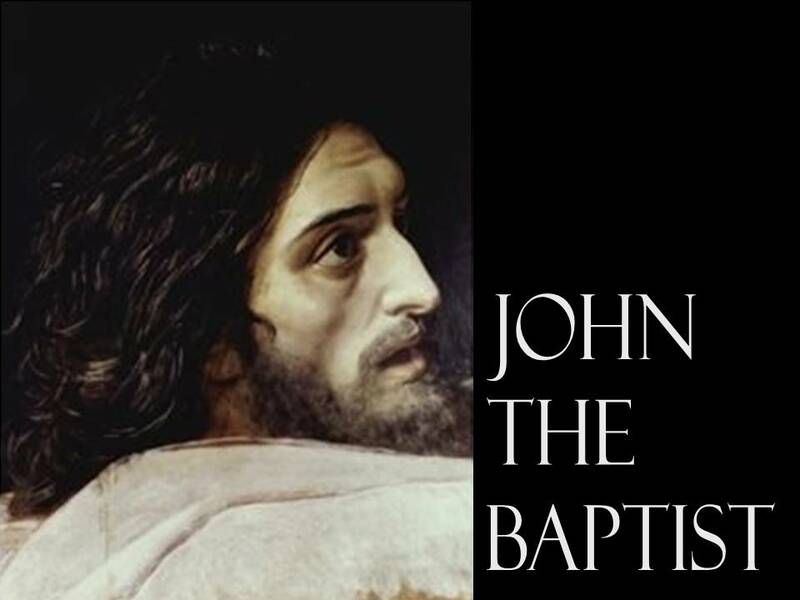 The baptism of John was a baptism of repentance from corrupt Judaism. 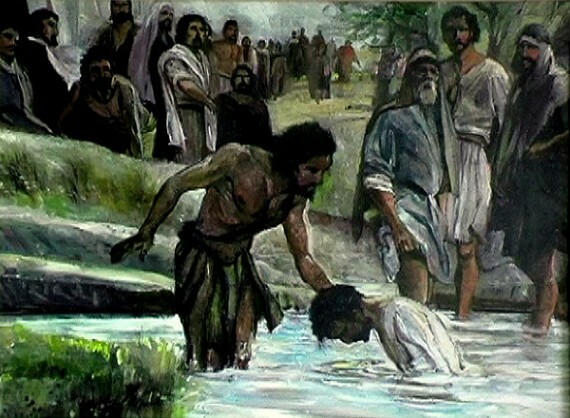 Now most people who came to be baptized by John also had to repent of personal sin in their life. This was not the case with Jesus. He knew no sin. He had never sinned. He was not born a sinner. He was sinless. So why was Jesus getting baptized? Because He was showing people that He was not going to support the religious Jewish corruption of the day. He was going to be the perfect Jew — the way God intended Jews to live. His life was not going to be a life of outward hypocrisy, but of inner obedience to God. We will see this over and over in the life of Christ. Though He often does things that were against the Jewish law and Jewish traditions, and because of this, He is often accused of sinning, He never once broke the law of God as contained in the Old Testament. He was going to live the way God intended people to live; not in the way the Jewish religious authorities had corrupted God’s law. And so that is why He gets baptized. Not because he has sinned, but because He is turning his back on the corrupted Jewish religious system. Now, none of us can say that we are without sin. All of us have sinned. We are natural born sinners. And so in order to be used greatly by God, we need to turn from our own corrupt practices. Other people may be corrupt, but God does not want us to concern ourselves with them. He wants us to examine our own heart, and look to our own condition. There is sin in the lives of every single one of us, and God wants us to repent of it, and turn from it, and live for Him. This is the first step in being used by God. You must turn from your corrupt practices. Secondly, though, you must pray. Luke 3:21b. …and while He prayed, the heaven was opened. Only Luke’s Gospel tells us that He prayed. And as a result the heaven was opened. Prayer is always the key which open’s heavens doors so that the blessings of God can pour down upon you. One of the reasons Jesus’ ministry was so effective was because of the time and effort he put into prayer. Failure to pray as a Christian is like failing to talk to your spouse in your marriage. Without prayer you will never have a good relationship with God, just as without communication with your spouse, you will never have a good marriage. Jesus made prayer a priority in his own life. And as a result, the heavens were opened, and He received a wonderful blessing. The blessing of the Holy Spirit. This is the third element to preparing for ministry. You need the Holy Spirit. We are not sure if it was an actual dove, or if it just looked like a dove, or maybe it looked nothing like a dove, but it floated down from heaven, and flew through the air like a dove would. But however it happened, the point is that when Jesus came up out of the water, the Holy Spirit descended upon Him. Jesus needed the Holy Spirit for effective ministry. After this, he is going to go and be tempted in the wilderness by Satan, but part of him being able to resist temptation was because the Holy Spirit was upon Him. In fact, all that Jesus did was because the Holy Spirit was upon Him. His miracles, His love for the unlovable, His powerful teaching, His patience and kindness. Jesus, though He was the Son of God, needed the Holy Spirit for effective ministry. And if Jesus needed the Holy Spirit upon Him and at work through Him, how much more do we? Now, you do not need to pray to receive the Holy Spirit. If you have believed in Jesus for eternal life, you already have all of the Holy Spirit. He has regenerated you, indwelled you, baptized you and sealed you. What you need to do, though, is learn to submit to the Holy Spirit. To be controlled by the Holy Spirit. In other words, to be filled with the Holy Spirit. How does this happen? By prayerfully studying the Word of God. The Word of God is the Sword of the Spirit, so as you feed on the Word of God, as you meditate upon it, it fills you. And as it does, the Holy Spirit, who always works through the Word, fills you also. Studying the Word and being filled with the Spirit are intricately connected. As you day by day, get into the Word of God, as you, like a sponge, soak up the Word of God, you will become soaked with the Holy Spirit. If you fill yourself with the Word, you will become filled with the Spirit. I want all of you to be filled with the Spirit, controlled by the Spirit, which is why I spend so much time in the Word of God in our church services. And that is why I give you these sermon notes on Sunday morning. It’s why we make tapes of the sermons available to anyone who asks for them. You see, on Sunday morning, or Sunday night, or in your devotions, you dine on the Word, you feed on the Word, but by taking notes, or listening to the sermon a second, or third time, you meditate upon the Word, you digest the Word. You chew the cud, so to speak. Look to these statistics. In a church where only 2% of the people open their Bibles and took notes, only 22 percent of them could remember the main points of the sermon by the following week. But in a church where 85% of the people took notes, 53% said they could remember the points. Almost 90% of the people who take notes say that it helps them pay attention to the sermon, understand the sermon better, and ingest or remember the sermon longer. If you want the Holy Spirit to have maximum control in your life, you need to have a maximum exposure to the Word of God in your life. You cannot have one without the other. Well, finally, before you can begin your ministry, before God can send you out to accomplish His purposes, You need the affirmation of the Father. It is always nice to know that God is pleased with what we are doing. That He is happy with the progress we are making. Jesus received this affirmation of the Father in the last part of Luke 3:22. Sometimes we forget, I think, that although Jesus was God, He was also human. He needed to be encouraged and praised just as much as we do. He wanted to hear His Father say, “Well done” just like we do. That’s what Jesus was aiming at. He wanted to please His Father. He wanted praise from God. And He receives it here, but He receives even more when His task on earth is done. Philippians 2 says that after Christ died and rose from the dead, He was exalted by God, and given a name above every name, that at His name, every knee should bow, in heaven and on earth, and every tongue confess that Jesus Christ is Lord. That’s affirmation! You too need the affirmation of the Father in your own life, don’t you? Oh, it’s good to hear encouraging words from one another, and to be praised by others in the church. But I think that most of all, we want to know we are pleasing to God. How can you know this? Well, in many ways. First of all, just like Jesus here, you need to hear a voice from heaven. Wouldn’t it be nice for God to say to you, “Hey, you are doing a great job. I love you so much. Keep it up”? Well guess what? He has said this to you. “When?” you ask. Every day. “Really?” Yes, if only you will hear Him. “I want to hear Him,” you say. Fine. It’s not hard. Every day, open up the Word of God and let Him tell you how much He loves you. You see, the Bible is God’s love letter to you. He wrote it to let you know how much he loves you. If you want to hear God tell you that He loves you, just open the Word of God and start reading. He put it down on paper so you wouldn’t forget it. He put it down on paper so you wouldn’t think it was just your imagination. He put it down on paper so you could get affirmation from Him any time you want, and as much as you want. For example, in Psalm 40, God tells you that He is always thinking about you. God always has you in mind. His thoughts about you cannot be numbered. The Bible says He watches you when you go to bed, and when you get up. He has even taken care to count the number of hairs on your head. When one of them falls out, God takes notice. That’s how much He cares for you. God’s Word is full of thousands of such promises. God loves you very much, and He wants you to know it by reading His Word. But also, God shows His love to you through answered prayer. When a prayer of yours in answered, that is God showing you that He loves you. We read in Matthew 7 that God loves to give good gifts to His children. We all love to receive gifts, right? When God answers a prayer, that is Him giving you a gift. Why? To show that He loves you. The greatest sign that God loves us, according to Romans 5:8 is that He sent His one and only Son to die for us. If He would do that for you, there is nothing good that God will withhold from you. There are many other ways God can show us that He loves us. He can show us this through nature, through fellowship with other Christians, and many other ways. God wants you to have an effective ministry, and He knows that in order for that to happen, He needs to encourage you and affirm you along the way. God has a ministry for you. You were made to fulfill that ministry. It was made for you alone. As you focus on what John focused on, and prepare the way Jesus prepared, you will be more fulfilled in your life than ever before. God made you for a purpose, and your life will not have meaning and significance until you find out what that purpose is and live it. What a beautiful message… thanks I can see for what I can’t see. May God bless you and give you more time to do this good work. Bless be the Father /Son/Holy spirit. Love you all. I thank you dearly for this message. I have been running for awhile because I felt inadequate. Now, I am more than really to do what God has purposed me to do. Keep writing to thee Glory of God. Have A Blessed Day!